I arrived in Krakow from Prague via a seven-hour train ride. I followed the signage from the train station to Krakow’s Old Town which took me through the mall, up to an exit through a Christmas market, down into a tunnel beneath a street and then into a lovely park dusted in a light snow. The walk through the park to one of the many streets that lead the square was quite soothing after a long day. Soon I reached the main market square (Rynek Glówny) on which my hotel, Betmanowska Main Square Residence, was situated. The 4-star Betmanowska Main Square Residence is the number one hotel on TripAdvisor for Krakow. Normally, I would highly recommend staying here, as the hotel includes many unique features, its location is very convenient, and its price is right. The hotel is located in the Betmanowska tenement house dating from the turn of the 14th and 15th century. While the entrance and lobby of the hotel are non-descript, the attention to detail in the rooms is second to none. Each room is different, but they all come with a tea kettle, fancy coffee maker, nice flat screen, free non-alcoholic drinks in the fridge which are replaced daily, and welcoming champagne, chocolates and fruit plate. In addition, the décor is lovely. The hotel’s breakfast buffet is worth purchasing. The chef will cook eggs to order and otherwise there is a grand selection of food and beverages including fruits, veggies, meats, cheeses, pastries, prosecco and flavored vodka along with coffee and tea! What I found frustrating about my stay, however, is that they put me in a room across from the smoking area and next to the construction. First, the hotel never disclosed to me that construction would be taking place during my stay. Second, for someone with a sensitive nose, the curtains and pillows smelled like smoke which they tried to mask with perfume. I was a good sport and stuck it out, though did ask that they WD-40 the door through which the construction workers constantly entered/exited with a squeeeaaak…BANG. Though it took them an entire day, to their credit, they got rid of the squeak, but not the BANG. As such, it was not a terribly restful place, and I had to put in earplugs supplied by the hotel anytime I came back to the room between tours and dinner. I likely should have asked for a different room, but logically I couldn’t understand why any hotel management would place a guest in the one room across from the smoking area and closest to the construction unless they were full. I asked for the discount to be applied to my stay, but that didn’t go anywhere. They could have easily comped my two breakfasts and transportation to the airport which was maybe $35, but they didn’t. So with that, I’d say, the service is fair. The hotel rooms are cool. The convenience is great but be sure to ask for a room on the northwest side of the hotel and away from the smoking area which is on the third floor. Had I known this tiny tip, I would have rated this hotel 5-stars! While I was in Krakow, I visited the Wieliczka Salt Mines, Auschwitz, the Jewish Quarter, and Old Town all via tours. Today I took advantage of the free tour I found on the app freetour.com. We met at St. Mary’s Basilica and ended at Wawel Castle Hill. St. Mary’s Basilica is located on the Main Square (Rynek Glówny) in Krakow’s Old Town. The brick Gothic church was constructed in the 14th century and is famous for its wooden altar piece. The church has two entrances, a main entrance for personal prayer and a side entrance for tourists. Half of the church along with the towers are open to tourists with paid admission. Every hour, a bugler plays the trumpet in the tallest tower. The tune is called Hejnal Mariacki and breaks off in mid-stream to commemorate the 14th century trumpeter who was shot in the throat while sounding an alarm of a Mongol attack. Before we left the church, we looked for a fake window in a nearby building. This is one of the things I like about tours. I would have never noticed a fake window on the third story of a building! From the church we walked northeast to Juliusz Słowacki Theatre. The theater was erected in 1893 and was the first building in Krakow designed for and equipped with electric light. The Baroque style theater is located on Holy Ghost Square in place of a 14th century church and monastery that was torn down. The Holy Ghost Square is just on the inside edge of Planty Krakowskie a park that encircles Old Town in place of medieval walls. The park, dotted with trees, pathways, sculptures, and benches, is absolutely lovely. I can only imagine how nice it is in the summer time. From the Theatre we walked along the edge of Krakow’s Old Town and the park to Krakow Barbican. The Krakow Barbican is a fortified outpost that was once connected to the city walls via a covered passageway over the moat to Florian’s Gate. The Gothic-style barbican was constructed around 1498 and is one of three remaining fortified outposts in Europe. The barbican now operates as branch of The Historical Museum of the City of Krakow. Across the path (once a moat) from Krakow Barbican is St. Florian’s Gate, the gateway into Krakow’s Old Town. St. Florian’s Gate is a rectangular tower built in the 14th century after the Tatar attack of 1241 which destroyed the city. The tower was one of many which have since been dismantled. St. Florian’s Gate was the starting point of the Royal Route which traveled down ulica Floriańska (Florian Street), through Krakow’s Main Market Square, and up ulica Grodska (Caslte Street) to Wawel Castle. Along Florian Street, look out for a plaque commemorating Jan Matejko, the most famous Polish painter. His paintings depict the history of Poland and hang in many Polish museums as well as the Vatican museum. Close by is the Jama Michalika Café which is one of the oldest cafes in Krakow. The café opened in 1895 and quickly became popular among students at the Academy of Fine Arts who could eat for free in exchange for small artwork. In 1905 the cabaret Zielony Balonik began performing here and a highlight was its puppet show. The café still displays some of the historic puppets. Before we carried on to Cloth Hall centered in Krakow’s Old Town Main Square, we stopped to watch the bugler play the Hejnal Mariacki tune. Cloth Hall dates back to the Renassiance and was once a major international trade center where products from the east like spices, silk and leather were imported and textiles, lead and salt from Krakow were exported. Now merchants use the stalls to sell amber and other trinkets while its upper floor features an art museum. Take note of the knife hanging to the right of one of the entrances. It hung there as a reminder not to steal. Ironically, it is not the original as it was stolen. On the other side of Cloth Hall in the Main Market Square of Krakow’s Old Town is the Town Hall Tower. The tower is the only remaining part of the town hall which was demolished in 1820 to open up space in the square. The tower is now a branch of the Historical Museum of the City of Krakow which has an observation deck for visitors. In front of the tower is a statue named Eros Bendato, a tribute to the God of Love. Eros is usually depicted with arrows, but this one has a blindfold suggesting love is blind and there are many victims of it. The statue is affectionately called the head and is a popular meeting point and photo opportunity. Soon, we headed west a few blocks from the main market square to Collegium Maius, Jagiellonian University‘s oldest building, which houses the University’s library. Inside the courtyard on the second level is the entry to a museum of lecture rooms, communal halls, a library and a variety of exhibits including the oldest globe in the world with America on it. Wander through the rooms imagining Copernicus or Pope John Paul II, once students at the University, studying here! In another nearby building of the University, Collegium Novum, 184 professors were invited to a “dinner” by the Nazis who invaded Poland in 1939. Instead of a dinner, they were arrested and deported to the Sachsenhausen concentration camp. The University was closed for the rest of World War II. Still in Krakow’s Old Town, we walked southeast to the Bishop’s Palace and Papal Window. The Bishop’s Palace is the second largest palace in Krakow and has been the residence for Krakow’s bishops since its construction in the 14th century. Today, the palace is most famous for having been the residence of Cardinal Karol Wojtyla before he became Pope John Paul II. During his visits to Krakow as Pope, he would often address crowds in the evening through the Papal Window. Across the street from the Bishop’s Palace is the Church of St. Francis of Assisi. We entered the 13th century brick and sandstone Gothic structure and sat in the pews where to Pope John Paul II often prayed! It was interesting to learn about the Pope. Karol Wojtyla was born in Małopolska, Poland in 1920. His mother died in child birth when he was nine. Three years later his brother died from scarlet fever. Upon graduating high school, he and his father moved to Krakow where he studied at Jagiellonian University. He was more of an athletic, outdoor type who wished to be an actor until his father died from a heart attack. By the time he was 20, he had no immediate family which led him to the Catholic Church. During World War II he participated in clandestine seminary studies and after the war he continued them until he was ordained as priest in 1946 and began preaching masses. Soon he travelled to Rome to complete his doctorate in Theology. By 1958, at age 38 he became Poland’s youngest bishop. Nine years later he became a cardinal and in 1978 he was appointed the first non-Italian Pope in over 400 years! The Polish people love him. He was so friendly many called him “Uncle”. Perhaps he has something to do with the fact Poland is the most religious country in the world?!? 95% of people identify with religious beliefs! The Pope is considered instrumental in the fall of communism in Poland. In 1979, just a year after being appointed Pope, he returned to Poland and delivered 32 anti-party sermons in nine days. This sparked the Solidarity revolution which eventually toppled the Communist regime in the late 1980s. After we learned about the Pope, we stopped to admire Szopka on display before leaving the church. 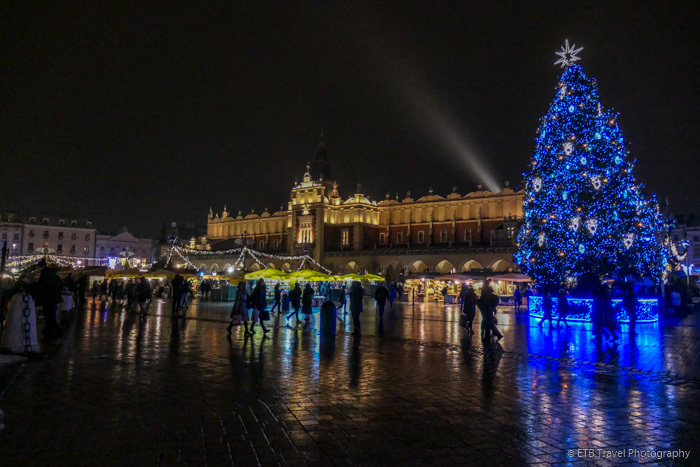 A Szopka features historical buildings of Krakow as a backdrop for the nativity of Jesus. They look like colorful castles. The tradition of Szopkas dates back to the 19th century when Krakow craftsman made them as a seasonal decoration to sell for extra money while winter construction was slow. Since 1937, with the exception of the duration of World War II, the city has sponsored a contest which begins on the first Thursday of December. Entrants bring their Szopkas to the Mickiewicz Statue in the center of Krakow’s Old Town Main Market Square. The nativity scenes are taken to the Historical Museum where they are judged, and the winners are put on display. The Szopkas are full of detail and take 600 hours to make. I saw several on display around the city, both near Old Town and in the Jewish Quarter. From the church, we continued south through Krakow’s Old Town until we reached Wawel Hill, home to the Wawel Castle Complex. The complex includes several buildings, but it is most known for the Wawel Royal Castle and Wawel Cathedral. For most of the Middle Ages and the Renaissance, Wawel Royal Castle was the seat of the national government. During this time period, the castle suffered from a few fires and was rebuilt featuring a variety of architecture though it began its decline after the 1595 fire when the King moved to Warsaw in 1609. Standing in the courtyard, there a few interesting features to note. While the arcaded courtyard is a fine example of Renaissance art, its roof isn’t flat like that of conventional Renaissance art. Instead it is sloped to handle the snowy winters. The mural just below the roof only wraps half-way around the courtyard. It is not completed. Also, the castle walls are not symmetrical, and the short wall is actually fake with a view straight through the windows! The castle now includes a variety of exhibits and tours. Each requires a separate ticket to enter. Next to the castle stands the Wawel Cathedral. This 900-year old Catholic Church traditionally has served as the coronation site of the Polish monarchs. This Gothic cathedral is the third church to stand on this site. The Wawel Cathedral is not only important in royal history, it is also important in Catholic history. It serves as the Archdiocese of Krakow. In addition, Karol Wojtyla who became Pope John Paul II, was ordained as a priest and a bishop in this church. He also gave his first mass a priest in the crypts of the cathedral. The cathedral is free to enter, though no pictures are allowed. The crypts, however, which have been the burial ground for Polish monarchs since the 14th century, require a ticket. A visit to Wawel Hill would not be complete without taking in the surrounding view including watching the Wawel Dragon statue breath fire. It guards the dragon’s den at the base of the hill next to the Vistula River. The dragon statue has six heads, though it only breathes fire from one. Legend has it that a dragon lived under the castle and terrorized the citizens for food. The fearful town folk asked King Krakus for a solution. In response, the King proposed a competition: whoever slayed the dragon could marry his daughter. Many brave men died fighting the beast. Finally, a poor shoemaker, Skuba, tricked the dragon. He fed it a sheep filled with hay and Sulphur. The Sulphur made the dragon extremely thirsty, so it drank and drank from the Vistula River until it exploded. As a result, Skuba married the King’s daughter Wanda. The free 2.5-hour tour ended at Wawel Hill for a nice history lesson of Krakow’s Old Town. I walked back to Old Town to enjoy the festive Christmas lights and Christmas Market. I also stumbled across a few other market squares, both inside and outside Old Town. Inside Krakow’s Old Town is Rynek Maly. It is only a block away from the main square and much quieter. The rectangular square served as a meat market in Middle Ages, but these days includes a weekend market of stalls selling amber, dolls, sweets and pierogis. Outside Krakow’s Old Town is Grzegórzecka 3, a flea market where the locals shop. I wish I would have stumbled across this market sooner! I love wandering through local markets.